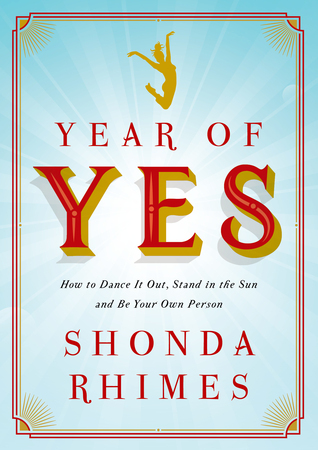 Year of Yes was written by none other than Shonda Rhimes. You know who she is - TGIT, HTGAWM, Scandal, Grey's Anatomy - THAT Shonda Rhimes.Like many people, I buckle down on Thursday nights and immerse myself in all that Shondaland has to offer. So, needless to say, when I found out she had a new book, I was already sold. Six words, "You never say yes to anything". Those six words, uttered under her sister's breath kick started a year of change. Year of Yes her personal account of that year. Shonda Rhimes decided she would no longer shy away from the things that intimidated her. Instead, she would tackle her fears head on. In the pages that follow contain a hilarious and empowering story. Shonda's take on motherhood is another one that I took to heart. On top of owning the television universe, she is also a single mother of three. She is a firm believer that being a mother is NOT a job, and I completely and wholeheartedly agree with her. In the chapter that speaks about her motherhood and her children. She notes that the single most important thing she has said "Yes" to is the question, "Do you want to play?". I reflected on all the times I have said no to this question because I was too tired, on my phone, or reading a book. My own children are craving my attention and say no. I've since taken Shonda's advice and now say, "Yes!". When I'm asked to play no matter what I'm doing, I stop, and I give my kids 15 minutes (they usually move on to something new before the time is up) of undivided play time. Hi Nita! Thank you for the note. I have been having a ton of issues with GFC and all my Google accounts. Appreciate the follow! Great review, I read this in January also. The mom quotes and part in book I totally agree also, being a mom is not a job, we cannot quit, HA. Great review. Her view on motherhood hits the nail on the head. I would quote the entire chapter if I could. Great review! Great choice of quotes - this book sounds really interesting. I'm actually not familiar with the author (yes, I live under a rock), but I'm always intrigued when it comes to more "positive" books.